I just had a baby, and the sleep deprivation was clearly visible on my face. I read online that a strawberry facial is great for people with dull, damaged or acne-prone skin, so I decided to indulge in one at De La Mer Day Spa. I was greeted by the receptionist who asked me to take a seat and she wasted no time in asking me my choice of drink while she handed me the questionnaire (a form in which you inform the therapist about your food habits, allergies and other conditions and which area you wanted them to focus on during your visit). 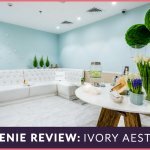 While I sipped my lemon water and filled in the details, Moira the owner came and chatted with me and showed me around the place and I was introduced to my esthetician – Tukta. Tukta was incredibly warm and friendly. She brought me to the treatment room. I asked about the specifics since I had never indulged in a strawberry facial and she informed me that this is an all natural facial and suitable for all skin types and age groups. I was hoping it would be a great way to unwind, relax and feed my hungry skin. The facial comprised of all herbal ingredients banana, yogurt, oatmeal, blended strawberries, honey, lemon, cucumber, brown sugar, moisturizing cream and an eye cream. Tukta mentioned that strawberry facial is very beneficial as it moisturizes, nourishes and refreshes the skin, helps prevent acne and is a great source of vitamin C.
My esthetician gave me a 2 minute foot massage to help me relax my exhausted body. She started the facial by cleaning my face and removing make up (this hardly took time for me as kohl and lip balm were the only 2 things I managed to put on everyday thanks to my demanding cutie pie !). Then she started cleaning my face with fresh yogurt. Since I went for a facial after a really long time, mine consisted of some SERIOUS extractions (get ready for some pain people…, it hurts to be beautiful! ), which was followed by exfoliation using brown sugar and banana. Tukta then used chilled cucumber, which is a natural toner for the skin. She then massaged my skin with a mixture of honey and lemon. My face mask consisted of strawberry, oatmeal and vitamin E and my skin was toned once again followed by moisturizing my eyes with an eye cream. Strawberry naturally contains salicylic acid which cleans out pores and rids blackheads without over drying the skin. The antibacterial properties in honey benefit acne-prone skin by reducing breakouts and also keep the skin hydrated. Lemon is a natural astringent that tightens pores and brightens the complexion. The natural ingredients were gentle on my dry and sensitive skin. My face glowed once again and was well hydrated. Post my facial I was given a 2 minute shoulder massage and then ushered in a room wherein I was offered herbal tea and cucumber. While I enjoyed my lil snack I was given a hot neck pillow to relax myself for one last time before I got back to the hustle bustle of the outside world. Unfortunately, I didn’t have time to use the showers/vanity area… but took a quick peek before I had to leave and everything was so well stocked and clean. This indulgent facial does more than tantalize your taste buds! My skin looked FAN-tastic…still does a week later. I felt so pampered as a new mommy! The staff is friendly and the environment relaxing not overly “spa’esque” but clean, warm and cozy. The facilities are perfect if you’re looking for great value treatment. I can’t wait to go back and try a massage. Sneha Dhadwal is a Dubai based PR and media professional currently taking a break from work. She enjoys going to the spa for various treatments and makes it point to try out local spas while traveling. updates & offers sent straight to your inbox!